Cambrian of North America, and possibly also the superficially amphioxus-like Pikaia from the Mid-Cambrian Burgess Shale of Canada. New discoveries from the Chengjiang locality in China (see Box 1.2), the source also of many exceptionally preserved basal deuterostomes, have extended the range of vertebrates back to the Early Cambrian (Shu, 2003). Myllokunmingia, 28 mm long, is streamlined in shape (Figure 3.1(a)). The head is poorly defined, but a possible mouth is seen at the anterior end. Behind this are five or six gill pouches. Up to 25 double-V-shaped myomeres extend along most of the length of the body. Other internal organs include a possible notochord, a heart cavity, and a broad gut. There is a low dorsal fin along the anterior two-thirds of the length of the body, and possibly a ventro-lateral fin along the posterior two-thirds. Another vertebrate from Chengjiang, Haikouich-thys, now known from over 500 specimens (Shu et al., 1999,2003a), is a slender, streamlined animal, about 25 mm long (Figure 3.1(b)). 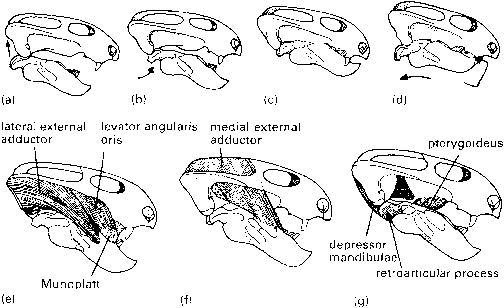 The head bears eyes and a small paired nasal capsule, there is a brain surrounded by cartilaginous protective tissues, and six pharyngeal gill arches extending about one-third of the length of the body. 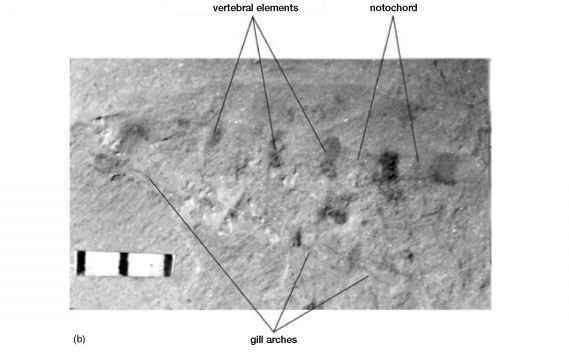 There is a notochord, and some specimens show up to ten separate squarish elements lying across the notochord, putative vertebrae, which may have been made from cartilage in life. The back half tapers to a slightly rounded end, and it is marked by a series of obvious, W-shaped myomeres (muscle blocks). There are traces also of structures interpreted as the heart, gut and a series of gonads (egg- or sperm-producing organs). Phylogenetically, both Myllokunmingia and Haik-ouichthys are placed low in the tree of vertebrates (see Box 3.1). Myllokunmingia was described (Shu et al., 1999) on the basis of a single specimen, and a second specimen suggested to Hou et al. (2002) that in fact Myl-lokunmingia and Haikouichthys are a single species. A new taxon, Zhongjianichthys, has been added (Shu, 2003b), a small eel-like animal with possible vertebral arches, two obvious eyes and possible nasal sacs. Shu (2003) groups these three Chengjiang fishes in the Myllokunmingiida. tably Anatolepis from Wyoming and Greenland (Figure 3.2), both assumed to have come from jawless fishes. These tiny specimens have a knobbly surface ornament that could represent scales of some kind, when viewed under the microscope. These fossils are important as they are composed of the mineral apatite (calcium phosphate), the mineralized constituent of bone (see section 3.2), a characteristic of most vertebrates, and not seen in the non-vertebrate chordates, nor in the Early and Mid-Cambrian vertebrates. The exoskeletal fragments of Anatolepis are composed largely of a dentine-like tissue around a pulp cavity, and they are somewhat tooth-like (Smith et al., 1996). These specimens show that bone evolved some time after the origin of the vertebrates, and that the apatitic tissues of vertebrates may be complex.